The South Korean government on Wednesday began the process of dissolving a Japan-funded foundation for “comfort women,” prompting strong protest from Japan. The Ministry of Gender Equality and Family on Wednesday said that the Reconciliation and Healing Foundation’s license will be revoked, beginning the dissolution process. Once the foundation is informed of the decision, the Gender Ministry is required to hold hearings where the foundation’s position will be voiced. Following the hearings, the license will be revoked on the authority of the gender minister, and a representative for the process will be selected. The ministry expects the process could take up to a year to be completed. The Reconciliation and Healing Foundation was established on July 28, 2016, based on an agreement made by Tokyo and Seoul’s Park Geun-hye administration on Dec. 28, 2015. The foundation was funded with 1 billion yen ($8.8 million) provided by Japan, and about 4.4 billion won ($3.9 million) has been paid to victims and their families. The majority of the surviving victims, however, have rejected the agreement from the start, saying that the agreement did not reflect their stance on the matter. According to the Gender Ministry, the dissolution process will be carried out regardless of the funds. The ministry said that it will consult with concerned organizations to determine how the funds will be handled. According to news reports, Japanese Prime Minister Shinzo Abe urged Seoul to adhere to the agreement, saying that the decision could damage the fundamentals of international relations. “A country’s relations with another country cannot be established if international promises are not kept,” Abe was quoted as saying by Japanese news outlets, describing the 2015 agreement as a “final and irreversible resolution” to the matter of sexual enslavement of Korean women by the Japanese military during World War II. Similar sentiments were echoed by Japanese Foreign Minister Taro Kono, whose comments on historical issues have incited strong criticism from Korea in recent weeks. Speaking to reporters on Wednesday, Kono said Japan cannot accept the decision, and that his ministry will demand Seoul to uphold the agreement. Japan’s Foreign Ministry also summoned Korean Ambassador to Japan Lee Su-hoon to convey Tokyo’s position on the matter. 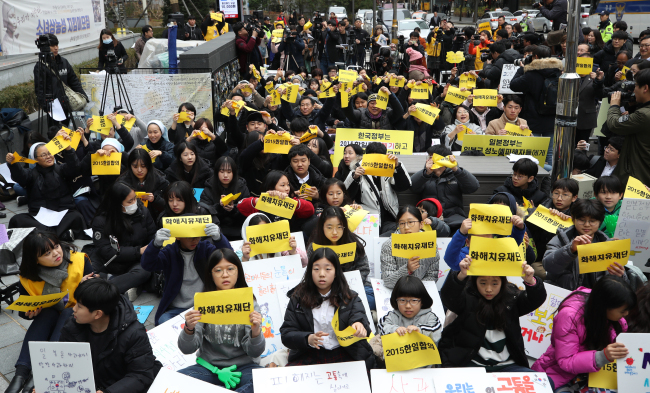 The surviving victims also called on the government to support their efforts to receive an official apology from Japan, and said that they hope for the 1 billion yen to be returned to Japan as soon as possible. The victims thanked the government, saying that the issue cannot be resolved between the governments of the two countries. They claimed that it is a matter between the international community and the Japanese government, whose stance on the matter violates international human rights law.